Select which option below you would like us to best contact you on. Failed to submit. Please try again in a few minutes. Miss Moneypenny V thrills with striking lines, 38 knots of speed and for ultimate guest comfort newly installed gyro stabilisers. Miss Moneypenny V has a stylish Italian exterior by Stefano Righini and a contemporary interior with bleached-teak wood floors and limed oak panelling throughout. Powered by triple MTU 4000 engines and reaching maximum speeds of 38 knots, guests can cruise in comfort and style. Accommodation for 9 guests is in 4 staterooms including a full beam master and VIP. 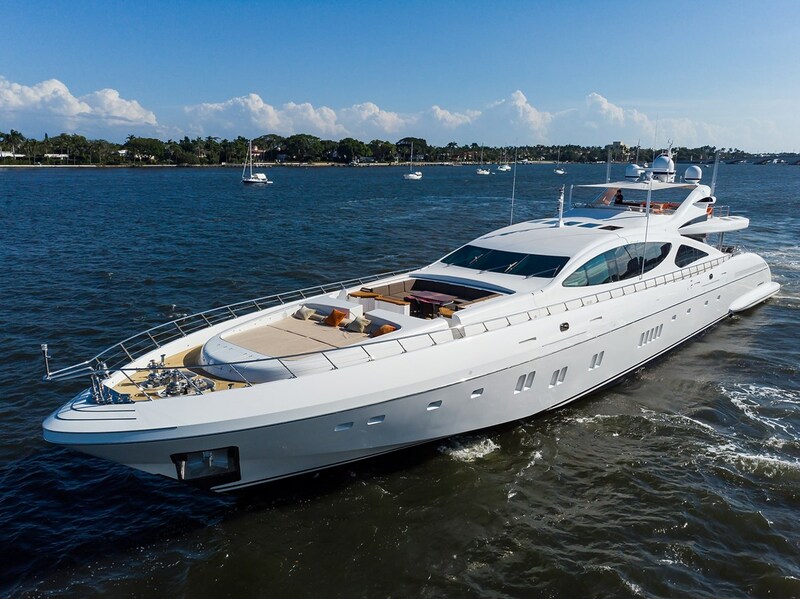 Other features include newly installed gyro stabilisers, upgraded high-speed internet, new soft furnishings in the main salon and media room and new teak outdoor tables on the aft, fly and fore decks, a gym, media room and an ideal draft for the Bahamas at 1.6m / 5’3”. One of our qualified team members will be in contact with you shortly. KATINA 60m / 196' 10"